I am in love with fabric!! Who isn't? There are so many ways to mix and match colors and fabric designs to make so many cool things! 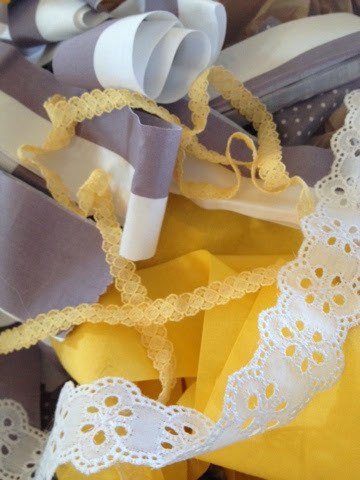 What I love best about this project is that not only is it super easy, but I was able to use up scrap pieces of fabric, my vintage lace and some other ribbons cuttings I've had stashed away...they were all too pretty to toss! 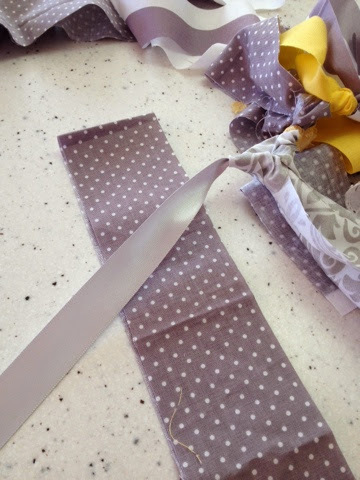 I pulled out my cutting tools & cutting mat and began working on these spring garlands...the fabric is from Riley Blake Designs and I'm loving the grey/yellow combination! Look how fun these yellows & grays are! 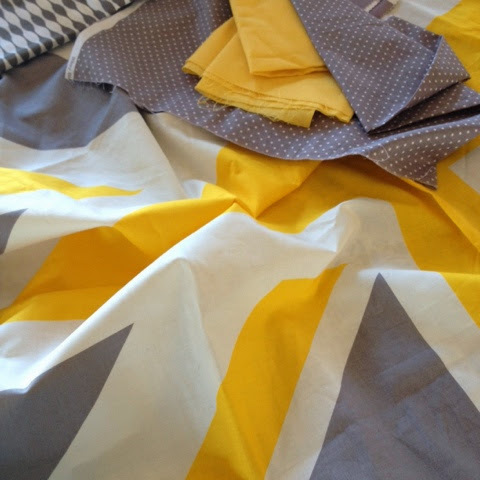 Riley Blake has the coolest Union Jack fabric! So, to get started. First, you lay out your fabric on a cutting board and use your Fiskar cutters or a pair of scissors. As you can see, I didn't even iron the fabric...no need! Cut 10 - 12 strips of one fabric in 16 inches length x 2 inches wide. Then repeat with the next fabric but this time cut them in 24 inch strips (10-12 each) and repeat with another fabric but cut them 36 inches x 2 inches wide and continue on with additional fabrics...any longer then 36 inches is probably too long. 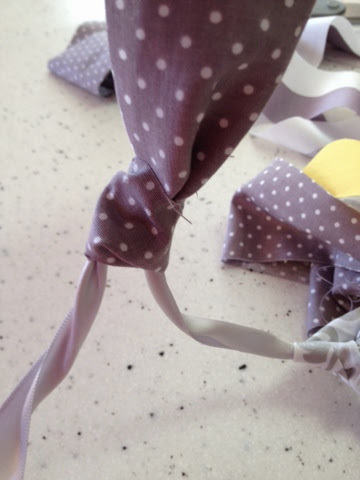 The varying lengths gives the garland the thickness and detail that makes it so pretty! 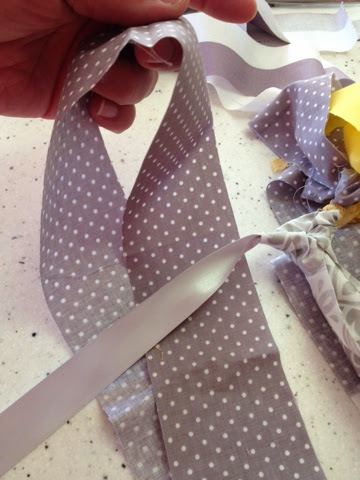 Next, take your fabric strip and tie it in a slip knot around the ribbon or twine you are using to hang your banner from. 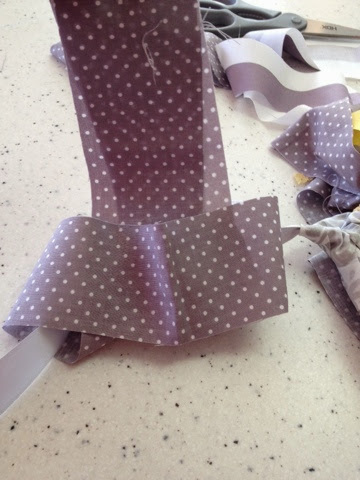 After you are done tying on the fabric strips, add ribbons, lace and anything else you have that would add to the garland. I added some bling by tying some silver, sparkle netted ribbon I found at Hobby Lobby. Next you can make your mini banner. You can use cardboard banners in a package, paint them and stencil or just cut one out of scrapbook paper. I decided to use this paper I found at Michael's! It's chalk paper on a heavy cardstock and comes in all the spring colors! I LOVE this paper! I just cut the paper into a pennant shapes, punched two holes at the top right and left of the pennant and then string your ribbon through. Again I added a touch of bling by using the silver glitter string. Using a piece of chalk write whatever words inspire you...the more pennants you add, the longer the word...I chose "Spring"
Now take the pennant banner and hang across your fabric strips and tie it on each end...and that's it! You are done! Now stand back and look at what you've created...doesn't it feel good? Use up any extra fabric you have around the house to make a variety of fabric scrap banners. Use them for birthdays, gifts, anniversary parties, graduations, baby showers or any occasion!